The season of Lent is here! 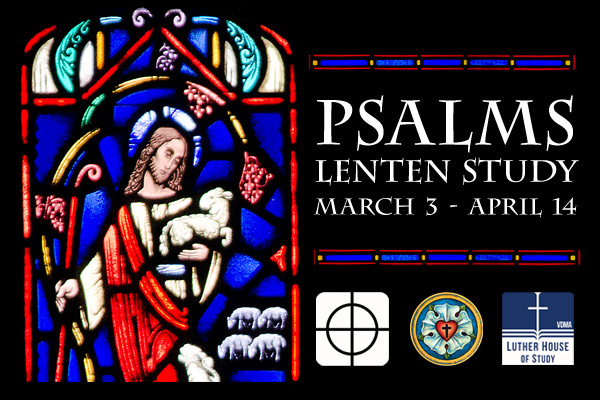 This year we will study six psalms during Lent, one for each week. Martin Luther loved the Psalter and used them as his daily devotional. Our hope is that you, too, will engage these Psalms through the videos and small group studies as part of your Lenten devotions. You will receive this wonderful study in several ways. Every Sunday afternoon you will receive an email with the video devotional, study questions, and a podcast where three moderators will discuss the psalm of the week with one of our pastors. If you don’t already receive FLC’s weekly emails, subscribe now. To supplement the devotionals, we are offering a number of weekly small group studies. Choose from a variety of leaders, locations around Sioux Falls, and meeting times. The small group meetings will last one hour. Though you’re welcome to register for a specific group, it certainly isn’t required. Simply choose a time that works for your schedule and join. You may even choose a different group each week. See small group opportunities below. Be sure to also join us each week during Lent at the Wednesday Lenten services to hear the pastors preach on the psalm of the week. Midweek services during Lent are at 11:15 a.m. and 6:30 p.m. in the Sanctuary. Take the Bible and cradle it in your hands. And as your thumbs come together over the middle of its sacred pages, open it. Here you come face-to-face with God’s living Word that has spoken down through the generations, for now some 2,500 years in our Judeo-Christian tradition: the well-beloved book of Psalms. Listen closely as you hear its “hymns” and “prayers” that speak from the middle pages of our lives as well. These are expressions that at once speak of our human condition of sin yet are also met by God’s Word of steadfast mercy and grace, reaching across the whole gamut of the life of faith: from “Out of the depths I cry to thee, O Lord!” (Psalm 130:1; RSV) to “God is our refuge and strength, a very present help in trouble” (Psalms 46:1; RSV). Here, in the book of Psalms…perhaps like no other portion of the Bible…we have God’s Word coming to us and for us on spirited wing, in the midst of our day to day lives—taking-up faith-filled residence in our words. Again, what an amazing grammar of faith is here—words of lament met by forgiveness, words of doubt met by trust, words that carry the heavy freight of frailty met by strength, words that reflect a poverty of spirit met by a wealth of joy and praise (which is the Hebrew title for the book of Psalms, Tehillim or “Praises”)—all spelled-out and grounded in God’s promise that has the power to create hope anew. Yes, “My cup overflows …” (Psalm 23:5b; RSV). And so it is, within the fulsome wonder of the Psalms, that we also stand in the middle of God’s working thumbs of salvation history: as their “hymns” and “praises” serve to prompt our remembrance of God’s covenant of old to Abraham and Sarah and his people Israel, to give ear to the prophets’ foretelling of the Messiah, and to realize the new covenant made manifest in the cradling, pierced hands of our risen Lord and Savior, Jesus Christ…upon whose very lips the psalms also find expression (cf. Psalm 22:1 and Mark 15:34), who calls us his “beloved” (cf. Psalm 2:7 and Mark 1:11). On behalf of the Education and Discipleship Board, I pray you find this study guide and devotional on the book of Psalms—along with the many small groups, podcasts, and other media—to deepen your understanding as well as lift up your spirit. “For with the LORD there is steadfast love, and with him is plenteous redemption” (Psalm 130:7b; RSV). Join one of the small groups to discuss the week's devotional, podcast, and discussion questions. Join the same group every week, or attend the session that works best for you that week. *Note: All small groups begin the week of Sunday, March 3, and run through the week of Sunday, April 7. *Free childcare provided at the church Wednesdays 5-6:30 p.m. and Thursdays 6-8 p.m.
First Lutheran Church is excited to offer a mini-retreat during Lent, intended to rejuvenate the souls of those who participate. We will explore some of the Psalms of Orientation, Disorientation, and New Orientation, as outlined in the book Spirituality of the Psalms by Walter Brueggemann. The retreat is hosted by FLC member Kathleen Moulton, Pastor Katherine Olson, and Care and Health Coordinator Jordan Stone. Guest musicians David and Margaret Houck (“David and Maggie”) will offer musical interpretation of the content we encounter. We will engage the book of Psalms through music and other forms: lecture, interactive learning and discussion, dramatic interpretation, art, and more! Participants should bring their Bible and a pen. Participant booklets and all other materials will be provided. The retreat will be held on Saturday, March 30, from 9 a.m. to 4:30 p.m. Cost is $20, due at registration. This fee covers materials, lunch, and refreshments. We are pleased to offer this retreat at a low cost thanks to a generous contribution from Lutheran Men in Mission and an Action Team grant from Thrivent Financial. The retreat will be held in the Three-in-One-Room on the second floor of Augustana University’s Morrison Commons building. Registration is open now through Friday, March 22. Anderson, Bernard W. Out of the Depths: The Psalms Speak for Us Today. (Philadelphia, Pennsylvania: The Westminster Press, 1970). Brueggemann, Walter. Spirituality of the Psalms. (Minneapolis, Minnesota: Fortress Press, 2001). Limburg, James. Psalms for Sojourners. (Minneapolis, Minnesota: Augsburg Publishing House, 1986). Mays, James Luther. Psalms. Interpretation: A Bible Commentary for Teaching and Preaching. (Louisville, Kentucky: John Knox Press, 1994). Peterson, Eugene H. Answering God: The Psalms As Tools For Prayer. (San Francisco, California: Harper & Row, 1989). Westermann, Claus. The Psalms: Structure, Content and Message. (Minneapolis, Minnesota: Augsburg Publishing, 1980). Psalm of 51 is a confession out of the lips of King David—a man understood to be Israel’s greatest king. In this Psalm, David speaks of how God deals with His sinners. This Psalm is the direct result of my encounter with God and his words—out of Nathan’s mouth. My very first words are “Have mercy on me, O God.” No one—myself included—can cry out to God for His mercy unless they know fully how deep their sin runs in their lives. And believe me, I’m not talking about little sins, I’m talking about the deepest of all sin—against God Himself and everything He said. While it’s true I was a great and wise King, you know wisdom begins with the fear of the Lord. And that fear comes when a preacher exposes your sin fully. No sin happens without starting in the heart, So I cry out daily for God to create in me a clean heart—a heart not full of sin, but filled with honor, love, and obedience to God. God did that to me. He created a clean heart in me when he sent Nathan to name my sin and then to tell me what God does with my sin: He has mercy. He forgives it. Nathan didn’t tell me how to clean up my act or make sacrifices to God in order to pay Him off. Nathan told me God is merciful; He isn’t getting even with us. And so, after hearing this preaching, I now want all of you to hear that same truth. God deals with His sinners not by requiring sacrifices or payment, but by giving us forgiveness and mercy. So listen again, sinners of the world, and cry out to God with me: "Have mercy on me, O God, according to your steadfast love. According to your abundant mercy, blot out my transgressions. Wash me thoroughly from my iniquity and cleanse me from my sin." Read 2 Samuel 12. What happened to David when God spoke through Nathan? Did David choose to have Nathan come to talk to him? What did Nathan do, or say, to David? Did Nathan tell David how to clean up his act, or did he do something else? How do you think David’s experience with Nathan relates to getting a clean heart from God? In this Psalm, David says that he sinned against God alone. How is David’s breaking of Commandments 5-10 the equivalent of breaking only the First Commandment? If breaking God’s First Commandment is the result of having a corrupted heart, what is the result of having a clean heart and a renewed right spirit? And how do we get a clean heart? If God doesn’t ask to be paid off or ask for a sinner to make up for their mistakes, what is it that God does with sinners? How is this related to God having mercy on a sinner? As you read all of Psalm 51, where is David’s focus and attention? Is it on David’s actions or somewhere else? How do you think that relates to you as you read this Psalm today? Most of you know I am a king with armies, palaces, and servants. But kings get sick, sin, and are betrayed like anyone else. You too will be betrayed, so I remind you of the law: “blessed is he who pays attention to the wretched” (vs. 1). Go to sick beds and minister to the poor; God will protect you, even in an epidemic. But my repeating the law didn’t end my trials. I was sick, and yet only liars and betraying friends showed up. They smiled at me while wanting me dead. But God, by himself, forgave my sin, lifted me from the sick bed, and defeated my lying enemies--blessed be the Lord! And two Amens for that! But did you know that more than a king, I am a prophet? I speak the words the Spirit gave me that are not mine, but Messiah’s, and he wants you to hear what the gospel sounds like. When I said, “pay attention to the lowly!” I meant pay attention to the One and Only Wretched, the Seed, Christ! He is the one crying out to his Father, “be gracious to me, heal me, for I have sinned against you!” (vs. 4). Listen to your Christ! You won’t think he could pray this, or that anyone could hate or betray this man Jesus. Yet his friends said: “a curse is on him…he will not rise!”(vs. 9). They didn’t want him to take their sin or have mercy. So, in his wretched state, Jesus said just what I said: “Even my friend in whom I trusted, who ate of my bread, has lifted his heel against me” (Psalm 41:9 and John 13:18). What friend? Judas. But Peter and the rest betrayed Christ as well. Yet, though crucified with our sins upon him, his Father lifted him from the death bed, and set Christ, not us, before his face forever. Two Amens to that! When you hear the words “consider the poor,” does this sound like a promise or something added to your “to do” list (the law)? When David tells you to look out for the poor, how does it make you feel? According to the Psalm, in what ways are those who consider the poor blessed? Are they getting something in return for helping the needy? If so, what do you think it is? If not, then what is it that makes them blessed? In the later verses of this Psalm, David is speaking for Christ. With that in mind, who is David/Jesus talking about when he says, “Even my close friend in whom I trusted, who ate my bread, has lifted his heel against me”? Does that make you read this Psalm any differently? In other words, how do you read even the earlier verses of this Psalm knowing David is speaking for Jesus? Where is David’s focus in the last several verses of this Psalm? What or who is it that David is looking to at the end of this Psalm? Is Judas the only one who betrays Jesus in the end? Is Peter’s denial a betrayal as well? How is it Jesus repays his betrayers? In what ways are the enemies of Jesus (sin, death & the devil) defeated by God the Father? A cry for help, like the one you hear from my Psalm, comes only from someone who faces great tribulations and trials. Where do we turn in these times? Do we look to the hills? Do we look to our wealth, our status, other people? From where does our help come? I wrote this Psalm to remind you our help comes from the one who does not slumber nor sleep. The one who protects you day and night, come rain or shine, sun or moon. Our eyes shall be fixed on the Lord—the maker of heaven and earth, the one whose Word creates you and me, and everything in this world. Our Lord won't let your foot slip from where you stand. He will provide you cover, not just for your body, but against the harshest of all trials—the assaults that come from the evil one. Remember, God promises that the Devil, who is bound and determined to take your trust in the Lord away, will not be able to move you one bit. It is the Lord, alone, who will protect you from all evil and watch over you while you sleep. This is His promise, and the Lord does not lie. And so we pray in this Psalm that when we experience the trials and pain of life, God will give us faith in his mercy, his promise, faith that he is sheltering us, defending us and strengthening us. Faith that he wins the final battle against sin, death and the devil. No matter what we feel. I am sharing these words with you so that you may remain strong in this faith and wait for God’s help and protection. The heart of this Psalm has to do with to whom or what we turn when times are tough. In the face of life’s struggles, where do people typically turn? Who are some of the people and/or things you’ve looked to in difficult times in your life? What is the Psalmist saying about where her help comes? What do you think is meant by the words “he will not let your foot be moved”? What does the video say God does in times of trial? What is evil, according to Scripture? (Look at Genesis 3 and the devil’s first words.) Does God let Adam and Eve remain hidden from Him in the Garden? In what ways does that story reflect what you hear in this Psalm, and how might this relate to you as a Christian? How do you know the Lord will keep you from all evil and watch over you? When did God promise you that you're one of His chosen ones? Read Genesis 1, the story of how God created heaven and earth. How do you think this Psalm relates to the creation story of Genesis? In other words, what does it mean for you to have a God the Creator as a creature God created? Is the Psalmist saying you will not suffer in this life because you are a Christian? Why or why not? If you are suffering in this life, discuss what you think the Psalmist means in verses 5-8. The news of your day is no different than it was in my day: the world is in constant uproar. Why do the nations rage? (v. 1). They don’t like God and positively hate his son: “The kings set themselves against the Lord and his anointed, saying, ‘let us burst their bonds apart, and cast their cords from us,” (v. 2-3). The world loves its own gods, but not the One true God, who put his own king on Mt. Zion, promising his anointed: “You are my son, today I have begotten you,” (v. 7). And how does God’s son rule? By forgiving you (as only God can) and taking your sin (as only this man can). So why does this make people so angry? Why call Christ’s promise a “yoke” and “chains” when it is free? Because we refuse to give up being right ourselves. Rage comes when you lose control, when God chooses and you don’t. And what does God do with our rage? He sits in heaven and laughs! (v. 4). God knows when we try to control our own destiny, we’re breaking the First Commandment. As we scramble to get what we think we deserve and pretend to be something we’re not, God watches our futility, sits on his throne and laughs. But that’s not the only thing God does from his throne. I wrote this Psalm so you’d know God sent his Son, his anointed, to be our ruler, to give us a place of refuge from our enemies. What enemies? You know them quite well: sin, death, and the devil. So listen again to what I say: Those who are wise will serve the Lord with fear. And those who do not kiss the anointed Son, Christ, who don’t come under his almighty power and mercy, will be left raging. Forever blessed, however, are you who take refuge in Christ’s unstoppable promise. Read the first three verses aloud. What does raging against God look like in today’s context? Discuss why people and nations rage against God. Can you think of any reasons and times you have raged against God? Is it accurate to say that most instances of rage are a result of people not being in control, not having the ability to do what God does? Why is God laughing in heaven? Could this relate to the fact that futility can be funny? Think of the definition of derision: contemptuous ridicule or mockery. How does it make you feel to think of God holding in derision those who are trying to be in control of their lives (be their own god)? Who is the Lord talking to in verse 7, “You are my Son…” What other story, or stories, in Scripture does this make you think of? In ancient texts, a king’s rule was often likened to breaking pottery; so “break” in verse 9 means to rule. How does that understanding impact your understanding of these verses? And how does Jesus rule? What does it mean to take refuge in the Lord (v. 12)? I’ve always loved processing up to the tent where God dwells and shouting: “Lift up your heads, O gates!” (v. 7). It reminds me of when I returned the ark to the sanctuary and danced before the mercy seat of God. I even thought I (add emphasis to the “I” when reading) would build God a temple, but Nathan preached, “The Lord (add emphasis when reading) will build you a house,” and “your throne will be established forever” (1 Chronicles 17:10 and 14). Who could argue with that? So, how do you worship the God of the whole earth (v. 1)? In trembling fear! We are to fear, love and trust God above anything else. Why fear? I once took a census of Israel without God’s command, and for my sin many people died and God put an angel’s sword between me and the tabernacle so I could not go up to him (1 Chronicles 21). Never again. Now, I wait for God to speak from the mercy seat, and when I get near, I shout: Who shall ascend…and stand in the holy place? (v. 3). Answer: The one who has clean hands and does not lift up his heart to a false God (Second Commandment, v. 4). But who is clean? Who dares ask for the doors to lift? I do, because I know it is the Lord who comes through to put his own righteousness into me (v. 5). God creates all, but even more, he takes sinners and creates them new. He is mercy, righteousness—and salvation! My ancestor Jacob also sought God’s face this way (v. 6). He was a cheater, but God put his righteousness in him anyway. Likewise, I do not come clean on my own, but God makes me clean. Before communion, say with me: Lift up your hearts! We lift them to the Lord! Which Lord? The Lord of hosts, who saves sinners. So we worship him for this word: I forgive you. The first two verses of this Psalm confess that God created the earth and those who live on the earth. What part of the Bible does this echo? David answers the question from verse three in the next verses. Read verses 3 and 4 aloud. What does it mean to have clean hands and a pure heart? Read verse 5 aloud. How does David answer the question of how we get clean hands and a pure heart? Is this the way you had thought of it before, or the way most people think of getting clean hands and a pure heart? Discuss what some of the differences are. For centuries, Israel dwelled in the promise that was first given to Adam and Eve. That same promise was passed down from one generation to the next, most famously to Abraham on a bright starlit night. God promised to send the Seed, his Son, our Lord to conquer sin, death, and the devil. This promise not only was passed on to me but is actually fulfilled through my family line. You have heard it said that out of the stump of Jesse, my family tree, would come the true King of Israel, the Savior of the world. This is what I’m speaking of in this Psalm. In addition to being in the lineage of kings, the Messiah is also in the line of Melchizedek, the family of high priests who oversaw the worship life of God’s chosen people. And just as the high priests were appointed to that role before Jesus’ time, so too was Jesus appointed by God to be a priest forever. And with Jesus as priest, he wouldn’t be merely another man in a long line of high priests; Jesus is the high priest who sits at the right hand of the Father, God. And what will Jesus do as high priest, our Lord? He will shatter kings and nations (v. 5-6). He will rule in the midst of His enemies (v. 2). But that doesn’t mean Jesus will get even with his enemies and his betrayers. The way the world shatters kings and nations isn’t the way our Lord works. Not at all. Jesus uses a very different Word to establish his Kingdom. Jesus’ Word of mercy turns our world upside down by forgiving sin; by choosing us, sinners, to be his children; by promising us eternal life. And when the Lord establishes his Kingdom with His Son, it is everlasting. “The Lord has sworn and will not change his mind” (v. 4). Read verse 1 aloud. Who is “the Lord,” and who is “my Lord”? For help discussing this question, read Hebrews 10:12-13 and 1 Cor. 15:24-28. Read 2 Samuel 7 aloud. With that in mind, read verse 4. Does the 2 Samuel reading help you have a fuller sense of what David is saying in verse 4? How so? Discuss how the promise God gave David in 2 Samuel relates to the promise God gave Adam and Eve in the garden (Genesis 3) and to Abraham (Genesis 22:15-18). When you read verses 2, 5, and 6, what do you think of? In other words, what are some of the images and feelings that come to mind when reading these verses? How do you think people in David’s time heard those verses? Is God’s/Christ’s understanding of verses 2, 5, and 6 the same as yours? In other words, were the expectations of the people before Jesus’ birth, crucifixion, and resurrection met the way we thought they would be met? Discuss your answer. When you read verses such as 5 and 6, how do you feel? Threatened, afraid? Discuss. Then discuss what God’s judgment is over you, specifically, and how you know this.